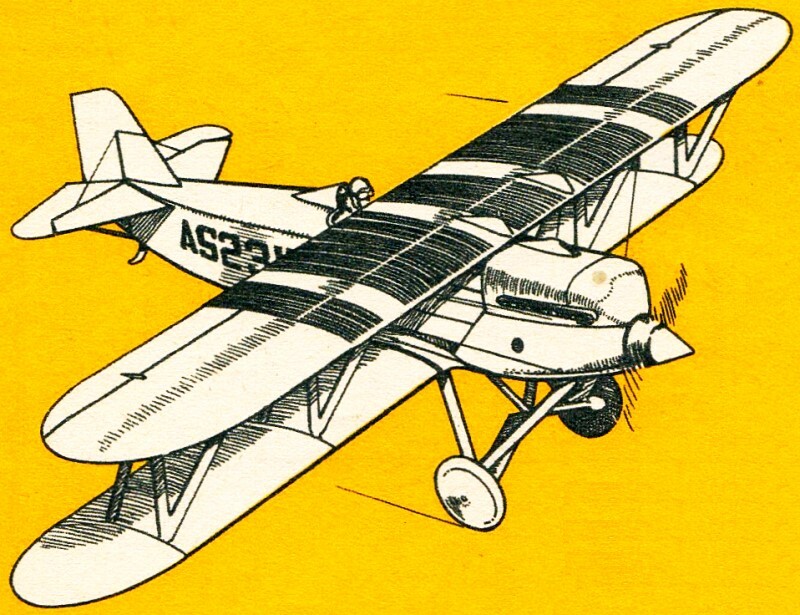 With this issue Air Progress introduces a new series in the story of powered flight - the famous firsts which this magazine considers to be of paramount importance. We start with Hubert Latham's flight in a gale, the first of its kind, in 1908. Tame today, this was even more heroic than it seemed for his 50 horsepower Antoinette monoplane (prototype model of Antionettes already illustrated in earlier numbers of Air Progress), had a well-deserved reputation for breaking up in the air and killing the pilots. Latham was also first man to attain an altitude of 5000 feet in an airplane, first to attempt the English Channel crossing (he tried twice - ditched both times), and first to make a prolonged flight over and around a major city (Baltimore, Maryland, 1910). 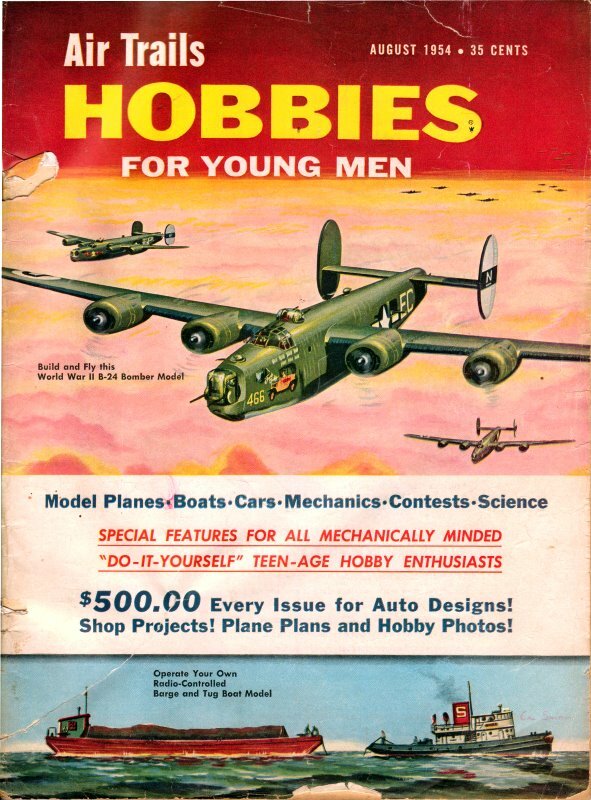 One other pioneer pilot (and designer) portrayed here deserves a few remarks. 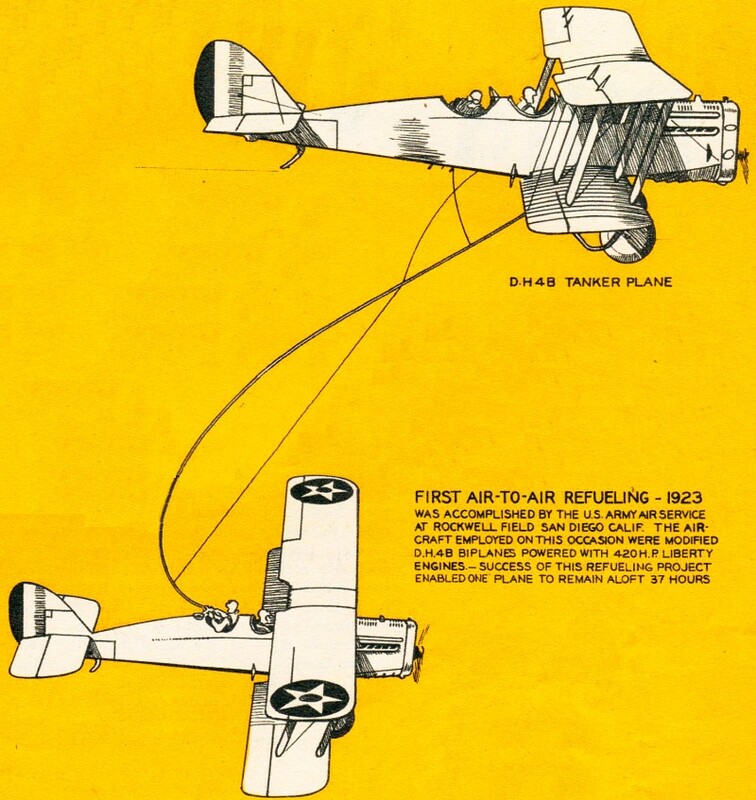 Louis Bleriot had another "first" to his credit - the first airplane crossing of the English Channel in 1909 - at that stage in the development of the airplane a performance comparable to Lindbergh's solo flight over the Atlantic In 1927. 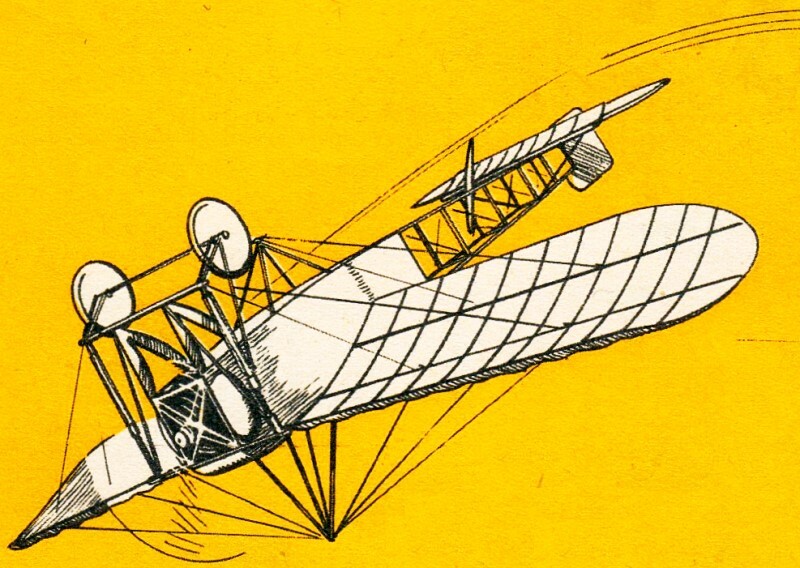 Bleriot's Cross-Channel airplane was a simplified version of his earlier cross-country model. First air-to-air refueling flights recorded here, and the first glove-girdling flights, also mentioned, are of paramount importance in the story of powered flight and definitely tie up with modern military air strategy and its emphasis on total global air penetration. First Flight in a Gale WindFirst Flight in a Gale Wind (right) - 1908 In a day when but a handful of pilots had mastered the simple turn and few, if any, attempted flight except under ideal weather conditions the famed French pioneer aviator, Hubert Lattiam, took off, flew for well over an hour and landed safely in a wind which at times reached gale proportions. World's First Airmail Flight (left) - 1909 Complete with special airmail stamp to honor the event was made by Hans Grade from Bork, Germany with a plane of his own design and construction. - Grade's plane had a fur­ther distinction - first German plane to fly! First Official Cross-Country FlightFirst Official Cross-Country Flight (right) - 1906 Louis Bleriot made the world s first officially recorded cross-country flight when he flew from Toury to Artenay (France), returning to the point of take-off. - Total distance, 18 miles, involved 3 landings. First Transcontinental Glider Tow - 1930 Capt. Frank Hawks, noted U.S. pilot, was towed in a Frankun Glider from San Diego, California, to Van Cortlandt Park N.Y. City covering the 2800 miles in an elapsed time of 8 days - flying time 36 hrs,47min. First Non-Stop New York-Chicago Flight - 1919 Capt. E.F. white. U.S.A.A.S.flew an Army D.H.4B 738 miles non-stop between the two cities at an average speed of 106 mph. First Recorded Normal Loop - 1913 Adolphe Pegoud, France, was first aviator ever to loop an airplane and first to demonstrate sustained inverted flight and may thus be regarded as an important figure in the development of aerobatics. 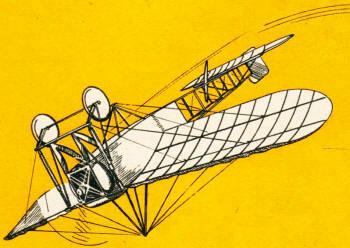 - His 50 H. P. Bleriot monoplane was specially braced for these flights. First Air-to-Air Refueling - 1923 Was accomplished by the U.S. Army Air Service at Rockwell Field San Diego Calif. 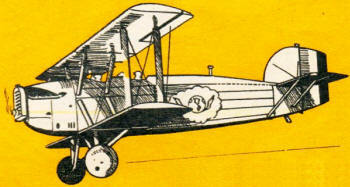 The aircraft employed on this occasion were modified D.H. 4B biplanes powered with 420 H.P. Liberty engines.- Success of this refueling project enabled one plane to remain aloft 37 hours. First Skywriting - 1922 Skywriting was first conceived in England by Major Jack Savage in 1910 but first public demonstration was given by Capt. Cyril Turner R.A.F. in 1922. - Aircraft employed were usually the S.E.5, fast-climbing World War I pursuit. 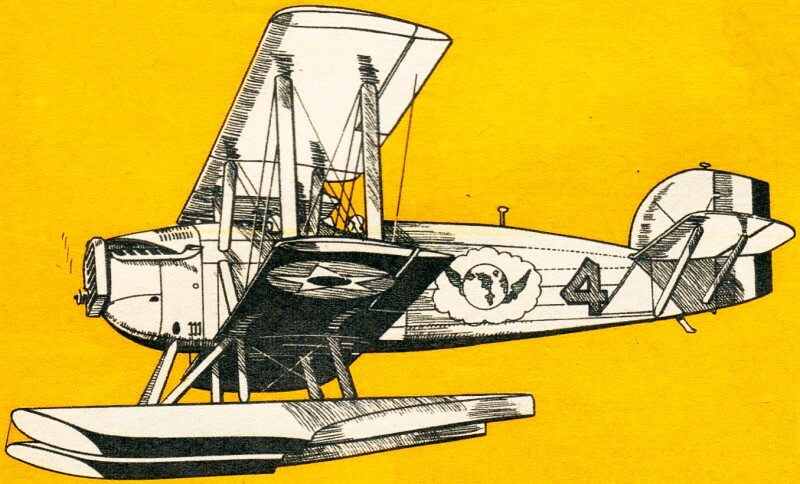 First Round-the-World Flight - 1924 After British, French, Italian, Argentine and Portuguese aviators had failed in repeated attempts to complete a round the world flight a group of U.S. Army aviators finally succeeded. Four aircraft (all modified Douglas torpedo bombers) participated in this epochal flight and two completed it after flying over 28 different countries and covering some 28945 miles, elapsed time was 175 days, actual flying time 371 hrs. Below is same airplane with standard wheels.